In an increasingly competitive marketplace that has seen the consumption of nonalcoholic beverages grow rapidly, producers must find highly flexible and sustainable processes. Higher costs for raw materials, water, energy, and logistics in virtually every geographical area force our customers to change their investment philosophy and optimize their economies of scale. As the variety of dairy and food products has expanded, the entire industry is challenged, especially due to the rather short shelf life of some of these products - quality of the product is always key. Winemaking is a complex and delicate process that is part art and part science and must be carefully controlled in order to produce the best wine possible. A wine’s quality depends on many factors. Biogas is a key renewable energy source that provides an alternative now and for the future. Upgrading biogas to biomethane, which can be fed into the public natural gas grid, offers additional potential. 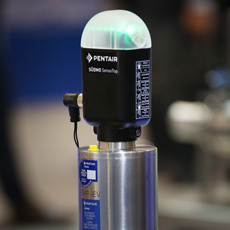 Pentair’s Food & Beverage Processing solutions include hygienic and aseptic valves and pumps, membrane technology for water and beer purification, filtration, and continuous beverage processing, carbon dioxide (CO2) systems, quality control equipment, microfiltration products, and biogas upgrading equipment. Inspired engineered solutions for a changing world!